NAMM 2014: PRS has unveiled six new finished for the SE Floyd Custom to make their debut appearance in Anaheim next week. The new SE Floyd Custom is an awful lot of PRS for the money: a mahogany body with a maple top and flame maple veneer, mahogany neck with rosewood fingerboard and bird inlays. It also sports SE HFS and Vintage Bass humbuckers, push-pull tone control and a 3-way blade pickup with coil-tap capability. The new 'launch' colours include Sapphire, Grey Black, Emerald Green, Amethyst, Black Cherry and Tobacco Sunburst, and there are only 50 models of each version available in Europe, with limited numbers in the US. The PRS SE Floyd Custom will be priced in the UK at £899. 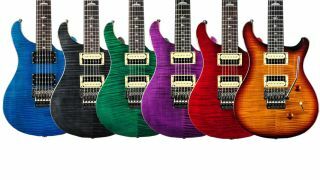 PRS Guitars has announced the release of a series of special edition colours for its new SE "Floyd" Custom 24 guitar, to be launched at NAMM 2014 on 23 January 2014. The new addition to the SE line pays homage to the guitar Paul Reed Smith took to his first tradeshow in 1985 and adds the tuning stability and wide-ranging trem abilities of a double-locking Floyd Rose 1000 Series bridge. The SE "Floyd" Custom 24 adheres to the fundamentals of the hugely popular existing SE CU24 - mahogany body and maple top with flame maple veneer, 25" scale length, 24-fret mahogany neck and rosewood fingerboard with birds inlays. The guitar is powered by SE HFS and Vintage Bass humbuckers harnessed to a push-pull tone control and 3-way blade pickup switch for coil-tapping. To herald the introduction of the first Floyd-Rose equipped model in the SE line-up, the SE "Floyd" Custom 24 is offered in a range of gorgeous 'launch' colours, which will be available in limited numbers. Sapphire, Grey Black, Emerald Green, Amethyst, Black Cherry and Tobacco Sunburst are the colours available in this limited run, with just 50 available in each colour throughout Europe (standard production colours are Amethyst and Vintage Sunburst). The recommended retail price for the new PRS SE "Floyd Custom 24 is £899 (€1095) including a PRS gigbag.